I have a post over at my church's resource page today. Here's the beginning, click through at the bottom for the entirety. A week before my birthday my husband prayed it would not be like the last two. In 2015, I witnessed the violent shooting of a police officer. In 2016, my husband was gone on a trip that didn’t go as planned—a terrible disappointment—and I celebrated by making myself banana pancakes and sharing them with my dog. It was a sad, rainy and lonely day. In 2017, I was supposed to be camping with a few close friends, but instead I spent the day moving from my bed to the bathroom, losing yet another little life inside me, our third miscarriage in three years. A birthday is simply a marker, an anniversary of sorts, a stake in the ground: I have been alive for 37 years and am now in my 38th year. But when that marker is marked doubly by sadness, tragedy or pain on an ongoing basis, it creates inward stasis. Moving forward seems impossible, so staying in place seems the way of safety. There comes a paralyzing fear of feeling anything in regard to pain; instead, it seems better to become stoic and indifferent to it. We know life holds suffering and God is sovereign over it, but when the suffering comes in waves and leaves no corner of our hearts and lives untouched, it can be tempting to find the deepest corner and bed ourselves there permanently, praying we can bear it. The Bible is not silent on this stasis, though, nor does it offer demands too insurmountable for the broken. The Word of God and the gospel offer living water even to those waiting by broken wells. Now there is in Jerusalem by the Sheep Gate a pool, in Aramaic called Bethesda, which has five roofed colonnades. In these lay a multitude of invalids—blind, lame, and paralyzed. One man was there who had been an invalid for thirty-eight years. When Jesus saw him lying there and knew that he had already been there a long time, he said to him, “Do you want to be healed?” The sick man answered him, “Sir, I have no one to put me into the pool when the water is stirred up, and while I am going another steps down before me.” Jesus said to him, “Get up, take up your bed, and walk.” And at once the man was healed, and he took up his bed and walked. Over the past month, I have been asking the Lord to show me the way out of my insufficient corner and into the way of trusting God with all my emotions, frailty, paralyzation and sorrow. He has been using this passage as a roadmap of sorts, and I am grateful for it. This passage is descriptive and not prescriptive—meaning it tells us what happened then, but not necessarily how it should always happen. But it does show us a common malady in the hearts of men and the posture of our Savior. Read the rest of this post at The Village Church Resources. The first time the word sin is mentioned in Scripture is not at the moment when sin entered the world, but the moment before the fracturing of two brothers, Cain and Abel. After Cain brought his offering to the Lord (which, for whatever reason known to them and not clearly to us, displeased the Lord), the Lord said, "Why are you angry, and why has your face fallen? If you do well, will you not be accepted? And if you do not do well, sin is crouching at the door. Its desire is contrary to you, but you must rule over it” (Genesis 4). That phrase, "Its desire is contrary for you," has always stuck to me like an autumn burr on a wool sweater. There are so many things in our lives pressing us back, crouching at our doors, slinking in unforeseen gaps and spaces, taking up room, both invited and uninvited. Sin is not a passive agent, but if we are passive, it can rule over us. There are so many areas in my life where I am the passive agent regarding sin. I say something smartly but intended to get my point across: sin. I leave something unfinished in hopes someone else will notice and do it: sin. I cite needs and desires as my primary motivator: sin. I avoid dealing with my emotions, letting them build and bubble over: sin. Wherever I look, sin is crouching at my door. A pastor at our church once said, "We don't get over our sin by constantly looking at our sin, we get over it by looking at the work of Jesus on the cross." This sounds really good, but if we don't make the cross both deeply personal and deeply practical, it can be difficult to see the ramifications of the work of Jesus in all the small places where sin reigns supreme in our lives. We can apply the gospel to the Big Sins, but overlook its power over the "little foxes that ruin the vineyards" (SoS 2:15). Nate and I have been talking about some work God did in us as singles and now as a married couple, ways we have recognized the power of sin to creep in and the ways it has ruled us (and still does in so many ways), and exercises we do to press back and bounce our eyes to the cross. These are not grand theological gestures, they are small things designed to teach us restraint, remind us to submit, to fear God, of the bounty of God, and of the joy found completely in him. Over the next few weeks I'll be doing a series of posts on seven ways we try to rule over the crouching presence of sin in our home. I'll expound on our methods for engaging the gospel in these areas of our lives, the ways we fail, and our hope for the Church more and more. 1. We choose reading, writing, and talking instead of screen-time in order to engage and flourish as flesh and blood humans. 2. We practice not a work/life balance, but a work/rest model in order to see God as our Creator, Redeemer, and Joy. 3. We eat whole foods, in-season, and locally if possible, in order to care for our bodies and the earth well. 4. We practice hospitality not as an event or social engagement, but as a way to sacrifice ourselves, our time, and our energy, for the flourishing of others. 5. We choose the way of peace instead of violence and listening over making ourselves heard, as a way to remind ourselves we are not omnipotent, omnipresent, or omniscient. 6. We eat meals together in order to press back against the culture of busy, quick, fast, and convenient. 7. We endeavor to live using restraint in our finances, not so we can build bigger savings accounts or retirement funds, but so we can serve others more freely today. I often get questions about the way we practice Sabbath as New Testament Christians or why we choose to have a young man living with us or what made us decide to not have a television, and more, and my hope is that in writing more on these specific intents, I will be able to answer those questions more fully. None of these things are without theological purpose and very real—sometimes painful—sacrifice. That's on purpose. Not because we're masochists, but because we're Christians living in a hostile-to-the-way-of-Jesus-environment. It's never been easier, more convenient to not carry the cross and follow Him. So how, in 2017, in the suburbs, without children, with paying jobs, with every gadget available to us, do we say, "No, sin, you will not rule over us. We're already the children of a King." The series will be tagged: Seven Ways so if you're looking for the whole thing at some point, just click on that tag at the bottom of the page. If you follow me on Instagram you're probably fed up with my exclamations of joy over the weather in Texas this year. If you know me in person you are definitely fed up with it. I made people physically get up from their chairs last night to go look at the sunset. I dragged my husband into the nearby golden woodsy area for family photos. I keep going on the same route for my walk every day because the trees are changing so slowly and dramatically and I don't want to miss a single moment of it. To understand this delight you must understand that fall in Texas is usually just fell. The trees turn from greenish brown to brown and then all drop in the span of a week. The weather moves from hot as blazes to bone-chilly in about the same time and the whole thing lasts about a month and then it's practically summer again. But not 2017. For all the other rotten state of things in our world, country, and, this week, our state, 2017 went gangbusters on the weather. So, thank you, 2017. We needed this. Humanity needed this. We needed to remember nothing lasts forever and everything beautiful dies in its time, and someday life will come again. Autumn is my favorite season. I love the dark mornings and dark evenings. I love the damp smell of leaves. I love the wind. I love the grey days. But I also love the things we do more frequently in autumn. I love dinner by candlelight and wool socks. I love heavier covers on our beds and warmer sheets. Fall bouquets and stews and soups. Give it all to me and I am happy. And, in the spirit of good-will, here are some ways you can enjoy your fall too. This habit. When the evening begins to dim by dinnertime, we light candles every night at our table. I prefer beeswax candles because they're better for you + they smell delish. These hand-rolled ones are great, but don't burn nearly as long as these. We have both though. This soup. This is a fall staple in our house. It is perfect on day one and day two and even day three if it lasts that long. I could eat soup every day happily, but especially this one. This moisturizer. If you're anything like me, once fall hits all the dry skin shows itself. I use a version of this and I love it. The place I get it from has discontinued theirs (plight of many small businesses...), but this one has the same three ingredients. I tried my hand at making body butter last week and so I'm going to attempt making my own version of this soon. I use it every single day on my face, neck, and hands. This bread. I make a loaf of this bread at the beginning of the week and it sustains our house-hold of three (two grown men and me) the whole week. You might need to make a double batch if you've got kids. The recipe is in the comments on this link. This wreath. We haven't got a serious garden this year (aiming for it in 2018), but this little herb wreath is a perfect way to preserve those herbs you grew and you can just pinch off a bit through the winter for your meals. This stew. There is nothing better than a good stew on a crisp day. This is one of my favorite recipes, although I substitute Bragg liquid aminos for the soy sauce. This pie. I made this pie a few weeks ago and it was gone in less than 12 hours. I'll do a few things differently when I make it next, namely simmer those cranberries down a bit before popping them in with the apples, but otherwise this pie was the perfect fall desert, tart and crisp and buttery goodness. The recipe called for 3/4 cup of sugar, but we like things more tart than sweet, so I halved that. It was perfect for us. This bouquet. As much as I love flowers, I love their autumn iterations even more. When I walk I gather bits and pieces of brown and golden and purple and berries and have them in vases throughout our house. They'll last all through the fall since they don't have to be kept in water and they just continue to dry out. Here's some more inspiration. A year ago today Nate and I were standing on the pinnacle of a familiar mountain, a place I called home for years and a place that still holds a piece of my heart. We were quietly dreaming, after a year of crushing disappointments, heart-ache, trauma, and loss. We were asking the questions "What if?" and "Where might?" It was the first time I felt hope in over a year. We made the beginning of a plan that weekend: to move to Chattanooga and settle there. There's a lot that happened between Labor Day 2016 and Labor Day 2017, but the shortest way to say it is that we're back in Texas, in the place we met and married, but not the place we fell in love. The place we fell in love is everywhere and everything. It was honeymooning in the Aspen trees and buying a house on July 4th and learning things weren't as they seemed at my new job and losing a baby we didn't know was beginning and losing his job we thought was certain and coming home to a police-taped home near Thanksgiving and cutting down our first tree together in the Rocky Mountains and witnessing the shooting of a cop on my birthday and and losing the beginning of another life we were sure of and navigating a church conflict we felt blindsided by and being disappointed again and again and again by hopeful job interviews and no call backs and packing all of our stuff again and moving again to another side of our country and losing more money than I'd ever dreamed of even having and living in our second 1800s home with creaky floors and uneven doors and charm and still feeling so alone every single moment. 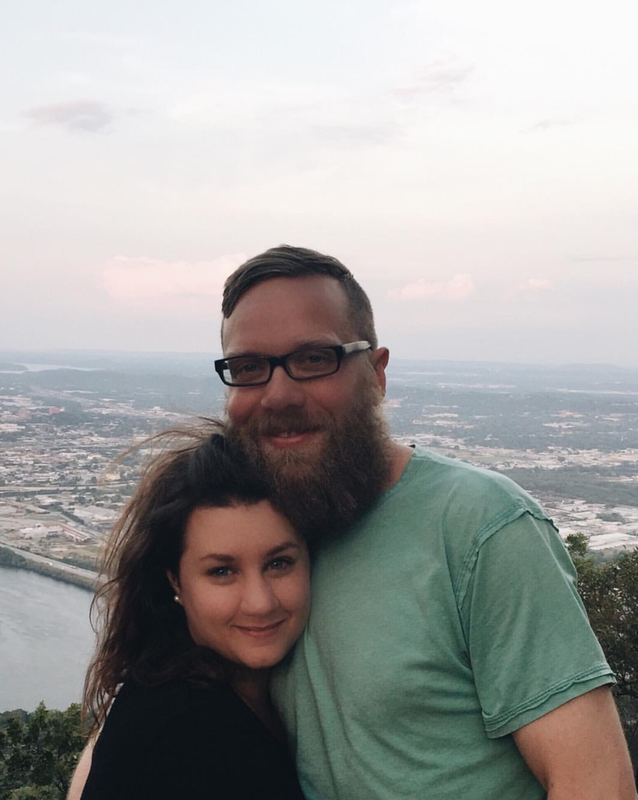 It was bringing home Harper and struggling to find a church home and learning the Chattanooga job market was another Denver job market and our dreams of moving there would not be realized. It was packing again, and moving again, back to the south. It was unpacking in a home we knew wasn't guaranteed or our "forever home" or secure or would be full of children or dreams coming true. What I'm trying to say is we can make a lot of plans, but our hope is in the Lord and he carries us through—and grows our capacity for life and love within it all. I get a lot of emails from you, dear readers, asking about love and marriage and singleness and how do you know and what is settling and all that. I guess I just wanted to say to you today: you can make a lot of plans and have a lot of dreams and just envision how your life should be and think it is all somewhat certain. Because you have a certain "call" or a certain "desire" or feel you were made by God for a certain "purpose," it can become so easy to believe life will turn out that way, all you have to do is make the people in it and the jobs you take and the decisions you make fit within that call or dream or purpose. I want to say to you, friends, that this is a lie. It's a sneaky one because it sounds good to have purpose and to aim for it straight. But the lie is that we think we're somehow owed the life we desire, even if God has not yet granted it and might never do so. You may feel called to be a mother or a husband or a pastor or a teacher or a writer or a wife or a single or a speaker or a counselor, but a sense of calling does not mean God will fulfill things in your order or way. The way to be a successful wife is not to have the perfect husband, the way to be a successful pastor is not to have a pastor's wife, the way to be a successful writer is not to have a successful book, and the way to be a successful single is not to be undistracted by the opposite gender. No. The way to be successful is simply to be faithful with today. Someday, when you are very old, or maybe not very old, and just in the middle of your life, you will look behind you at a series of crushing disappointments, plans that went awry, ways you felt stolen from and lied to, and you will see the faithfulness of God pressing you into the way of a faithful servant. This is the mark of a successful child of God. The answer to the questions we're all asking can be summed up with another question: What is the presence of the Holy Spirit inside of you—within the confirmation of Scripture—telling you to be faithful in today? That's it. That's our answer. Your life will take many twists and turns and near fails and falters and wins and losses, but if you're pent up inside trying to situate yourself in such a way for success as you determine it, you will feel lost on the way. No matter how strategically you play the pieces of your life, you are not guaranteed the win you envision. You are only guaranteed the win you have been promised in Scripture. The sooner we can all learn things won't turn out like we planned because life is not some choose your own adventure book like we all think it ought to be, the sooner we can rest in the comforting presence of the Spirit, the true promises of Scripture, and the beckoning care of the Father. Whatever decision it is that's tying you up in knots today? What does it look like to open your hands around it, obey the Spirit (as hard as it might be), and let the trajectory of your life take an unexpected and—perhaps—painful turn? I promise you, no, Scripture promises you! There is the joy of your Master at the end of the story of your life—a story you can't even imagine today he would write for you. That time we made a plan to move to Chattanooga and didn't.